This year’s National is on Bank Road. Last time it was held in Matlock Matt Clinton took the honours, riding fixed. This year, the big hitters have begun creeping out of the woodwork, most looking very ill, very pale and very thin. Adam Kenway: serial nearly man in the event and Metaltek Kuota firebrand. Came scorching out of the blocks to win on the Cat and Fiddle and at the Bolsover event – a modish smashfest up a closed road at night-time. Kenway took bronze on Pea Royd in 2014; this year is a similar climb and he looks in good form. Joe Clarke: kept his powder dry but emerged off the back of a successful road season, winning his last race and confirming his Elite licence. Won on Pea Royd today (25 Sept), charging round the first corner at a ridiculous speed. Richard Bussell: the man to beat, by all accounts. Armed with a fixed wheel weapon and determined to lose 5 kilos in 5 weeks. Came third behind Dan Evans and Ed Laverack on Porlock this morning. James Gullen: some unbelievable time trialling this season; clearly going faster than ever before. Came second on the Stang by a couple of seconds to Tevjan Pettinger in 2013; looks in ominous shape. Dan Evans: picked up the win at Stoke Hill near Exeter on Saturday, second to Laverack on Porlock. 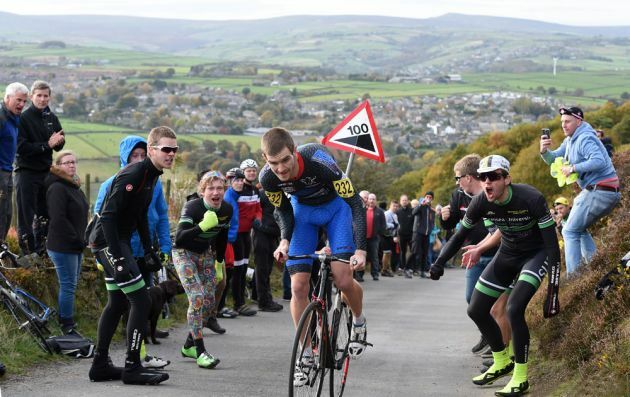 Going by his win on Pea Royd in 2014, Matlock should suit. On his day, phenomenal strength and power output make him very difficult to beat. The same could be said for Bussell though. It will be tight at the top. It could also be someone else not mentioned above.